EMI (Equated Monthly Installment) a fixed payment amount made by a borrower to a lender at a specified date of each calendar month. Equated monthly installments are supposed to be paid monthly in interest and principal both, so that over a specified number of years, the loan gets paid completely. By using our software you can easily calculate your EMI calculation. Preparation of CMA data for as many years as required. 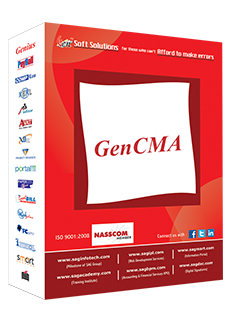 The Gen CMA/EMI facilitates the user to calculate day to day and simple interest. It is a useful tool to calculate Partner Interest, OD and CC A/c Interest. The software also commands for the MPBF calculations according to Tandon and Nair Committee. EMI and rate of interest are calculated by using this software. Apart from this, it also calculates the present value and maturity value, FDR and panel interest with converter tool for various measurement units. 1. Gen CMA prepares the CMA Report in both ways viz; Ratio basis, Percentage basis. 2. Preparation of CMA Report as recommended by NAYAR & TANDON Committee. 3. It also calculates the EMI. 4. It calculates the Interest for instalment of loan or analysis of present value. Complete client database can be managed including telephone & address book. A special provision for keeping clients important documents in various formats like:- word, excel, PDF, scanned documents etc. Important information like all India Pin codes, STD codes, ISD codes TIN FCs, TAN/PAN AO Codes , Bank BSR Codes, Service Tax Ranges, MICR & IFSC Codes. Facility to verify PAN/TAN online.